Curing means maintaining a satisfactory moisture content in concrete for a long enough time during its early stages so that its desired properties develop. The amount of water in concrete while it is being placed is normally more than needed for curing. However, concrete that dries out too quickly may not retain enough water for the hardening process — a chemical reaction called hydration. Temperature greatly affects hydration. While hot weather can make concrete harden and gain strength faster, it ultimately leads to a weaker concrete than one which has been kept cool (50 to 70 degrees Fahrenheit) during its first few days. The goal is to keep concrete cool and moist so it gains strength slowly, but efficiently. Laboratory tests show that moist-cured concrete can be twice as strong as concrete cured in a dry environment. Curing can help concrete be more resistant to damage from freezing and thawing. As long as hydration continues, the cement paste hardens and becomes denser. If concrete is cured properly, it will be less porous than uncured concrete — making it more difficult for water and salts to penetrate. Probably the best method for curing concrete, although sometimes the least practical, is to flood the surface continuously with water for the first week after placement. Do not let the concrete dry out. 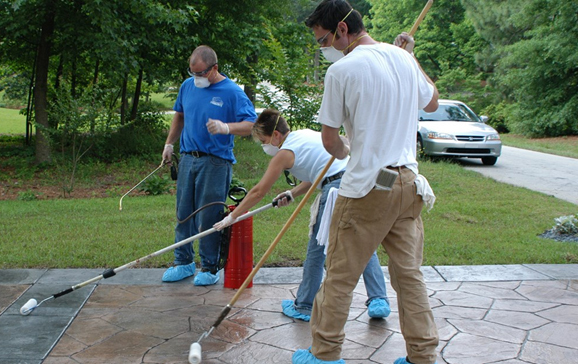 Contractors sometimes will recommend to a homeowner to wet a new driveway during its first week. But, if concrete dries between soakings, this alternate wetting and drying may actually damage the concrete. If you are going to water cure, keep the sprinkler going continuously for at least one week. The most common way to cure new concrete is through a liquid membrane-forming curing compound also known as “cure and seal”. These materials are usually sprayed or rolled on the surface. When dry, they form a thin film which restricts moisture evaporation from the surface. Timing is most important when using a curing compound. These products must be applied as soon as final finishing is complete. Otherwise, they could mar the concrete’s surface. Also, be sure to check with your Kuhlman sales representative for recommendations on what to do when cold or freezing temperatures are anticipated. The next most important thing is the application rate. Be sure to follow the manufacturer’s recommendations completely. The goal is to keep concrete cool and moist so it gains strength slowly, but efficiently. Laboratory tests show that moist-cured concrete can be twice as strong as concrete cured in a dry environment. When choosing the curing method and materials, consider how you intend to seal and maintain your concrete in the future. The curing method can affect your sealing decision. 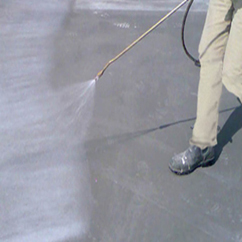 The most common type of membrane cure is “cure and seal.” However, this is not a one-step process for permanent concrete sealing. It dictates the use of a film-forming sealer unless the cure and seal is chemically removed or sand-blasted away. If you plan to use a penetrating sealer for ongoing maintenance, then your concrete should either be: a) moist-cured, or b) cured with an easily removed concrete curing compound. By making the sealing choice before your concrete is installed, you can inform your contractor on the curing method you prefer. Sealing concrete provides ongoing protection. Just as you paint your home regularly, you should seal your concrete routinely to protect it from moisture and prolong its life. When concrete is first placed, you want to keep moisture in; once it has matured, you want to keep moisture out — particularly concrete which will be subject to freezing and thawing. The major way to make concrete more resistant to freeze/thaw cycles is through air entrainment — the purposeful addition of tiny air bubbles into the concrete during batching. After the concrete hardens, these air bubbles remain and allow room for the expansion of freezing water that may be in the hardened concrete. If the surface of hardened concrete is wet for a long time, some of the water will be absorbed and will saturate the concrete. While salt itself does not harm the concrete’s surface, its melting of ice and snow keeps the surface water-saturated. When this saturated concrete freezes, the air entrainment system is overloaded, causing the air pocket walls to rupture and damage the concrete. Although the air bubbles may be enough, you can assist by limiting the amount of water which can get into concrete by sealing it with a product designed to keep out water and deicing salts. There are two main types of concrete sealers: Those forming a film on the surface of the concrete, giving it a wet look, and those designed to penetrate the concrete, leaving it looking dry, yet water repellent. Each has advantages and disadvantages. Film formers are usually made from acrylic or rubber-based compounds. They form a thin coating on the concrete’s surface, leaving a wet look much like varnish on wood. These products ten to be less expensive per gallon than penetrating sealers, but need more frequent applications. They also protect against some stains better. Film formers do tend to darken concrete. Also, too much of a surface-film buildup may reduce the friction that keeps feet or tires from slipping. Most penetrating sealers are made from derivatives of silicone called silanes or siloxanes designed to penetrate concrete pores. Once there, they react with the alkaline materials and moisture present to form silicone, making concrete water-repellent. While penetrating sealers usually cost more, they should also last longer. Another reason penetrating sealers are popular is they don’t change the concrete’s appearance when properly applied. The major concern is that there can be no other membrane cure or sealer on the concrete when applying, and the concrete must be at least 28 days old before application. Your Kuhlman sales representative can suggest curing and sealing compounds which will meet the requirements of your project.